Brown bears (Ursus arctos) are among the largest living carnivores on the planet. Within the species there is considerable variation between individuals, which has led to the formation of two different subspecies -- Kodiak bears (Ursus arctos middendorff) and grizzlies (Ursus arctos horribilis). Grizzly bears are the more common of the subspecies and are sometimes listed interchangeably with brown bears. Though Kodiak bears and grizzly bears are part of the same species of brown bear, they are different enough to constitute two subspecies. A subspecies is a classification of life more specific than a species. Subspecies include organisms that are similar enough to one another to fall within the same species, but have enough distinctions to warrant further classification. Often members of two subspecies are able to interbreed and produce viable offspring, which members of different species cannot do. The primary distinguishing feature between grizzly and Kodiak bears is where they live. The range of the Kodiak is limited to just the islands of the Kodiak archipelago of southwestern Alaska. This population of bears has been separated from the mainland animals for roughly 12,000 years, and this geographic isolation has allowed them to develop into their own subspecies. Grizzly bears, on the other hand, are much more widespread; they're generally found in inland areas of the Canadian provinces of the Northwest Territories, Yukon, British Columbia and Alberta, and the U.S. states of Alaska, Montana, Washington, Wyoming and Idaho. The geographic differences between these two subspecies has also led to differences in size. Generally Kodiak bears have a larger bone structure, and therefore larger frames than grizzly bears, though both species can reach very large sizes. Kodiak bears are among the largest of all bears (averaging slightly smaller than polar bears), and males can reach weights of up to 1,500 pounds and are able to stand up to 10 feet tall when on their hind legs. Grizzly bears can weigh up to 1,150 pounds. Among the other distinguishing factors that can occur when two members of the same species are isolated from one another for long periods of time are differences in behavior and social structure. Kodiak bears' home range is able to support a higher population density of bears, due to plentiful food sources. Because of this, Kodiak bears have developed more complex social structures and communication to allow them to live together with minimal conflict. What Are the Behavioral Adaptations of Wolves? 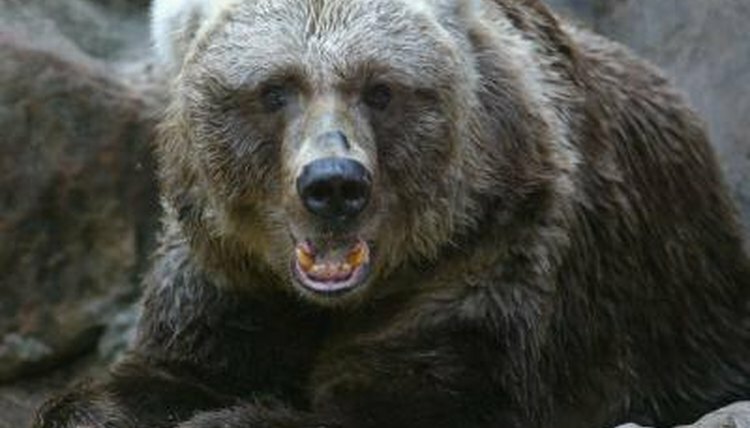 How Much Area Does a Grizzly Bear Cover in One Year? What Does an Africanized Honey Bee Look Like? Where Did Grizzly Bears Originate? How to Tell What Lion Is the Leader?